Disney The Good Dinosaur Toddler Boy's Arlo Green Plush Slipper Only $2.99! Down From $14.99! You are here: Home / Great Deals / Disney The Good Dinosaur Toddler Boy’s Arlo Green Plush Slipper Only $2.99! Down From $14.99! Disney The Good Dinosaur Toddler Boy’s Arlo Green Plush Slipper Only $2.99! Down From $14.99! Disney The Good Dinosaur Toddler Boy’s Arlo Green Plush Slippers Only $2.99! Down From $14.99! 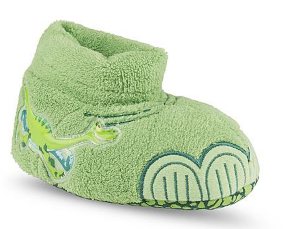 Sears has these Disney The Good Dinosaur Toddler Boy’s Arlo Green Plush Slippers on sale for $2.99 (Reg. $14.99)! These are perfect for any The Good Dinosaur fan! Plus you can get FREE in-store pick up! Please keep in mind in availability can vary from store to store!